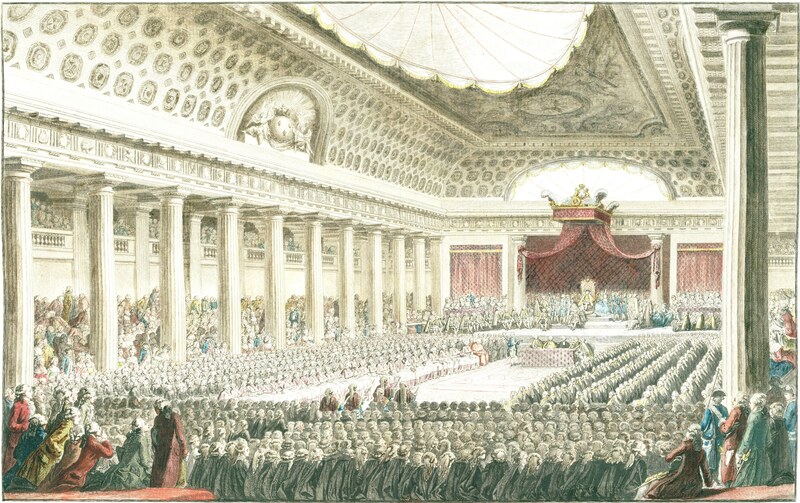 King Louis XVI would finally decide to call for the Estates General to meet in 1789. This was a parliament like body that was comprised of the 3 Estates that met at the Hôtel des Menus Plaisirs in Versailles. It had been so long since the Estates General had met that no one really knew how the process actually worked (hadn’t met since 1614). They would elect representatives from all over France to come here, and each representative would bring a list of demands they had made based on the needs of the people from their area. The fact that the representatives had asked their opinions made the local people believe that changes may actually be possible, something that would have been unheard of in previous years. an attempt to make sure that the votes from that Estate mattered. After agreeing upon this they would continue talk of change by discussing the idea of democracy in France. This radical debate would turn into a group attack on the policies of the monarchy and the Ancien Régime, which would not go unnoticed by the King. Once King Louis XVI heard of what was discussed at the Estates General he would lock the building to end this meeting, claiming that carpenters needed to prepare for his upcoming speech. The King became worried about the possibility of a coup d’etat so he brought 10,000 troops into Paris to protect against that, but he would choose a group made partially of foreign mercenaries for this job due to his fear of a revolt of French people. His biggest fear was that any French troops would agree with the protesters and simply join them in the revolt, which would be powerful enough to remove him from office. The use of foreign troops seriously worried the leaders of the Estates General, who believed that the King was going to use these forces to silence them in general. These leaders would choose to move their meeting to a handball court to continue talks, with the 3rd Estate not willing to give up their newly found power. This movement was led by Abbé Sieyès and the 3rd Estate, but they extended invitations to many of the other leaders, especially if they were known to be enlightenment thinkers. This collective group would swear the “Tennis Court Oath” (known that way by historians despite being done on a handball court), in which they promised to continue meeting until they had created a constitution for France. Despite the fact that this was an act of treason, all but 1 out of the 577 men would sign the document. This act of defiance against the King would later be known as the official start of the French Revolution.